When it comes to everyday fashion, the clothes we wear seem to be getting more casual with each passing year. Blame it on the power of trends such as streetwear, or even the rise of startup businesses and creative offices that lend themselves to less formal attire for the office. All things considered, we’re not that upset about it, but there do come times when we want to feel more dressed up; the right pair of evening shoes will help you achieve exactly that. While the term “evening shoes” may have you feeling like you need a special occasion to sport the pair of pretty heels, don’t let that deter you. After all, shoes are one of the many things that can take your entire ensemble to a whole new level. Style them with a sleek skirt and a classic blouse for a night out with your beau, or even wear them with your favorite jeans and a tee to create a cool juxtaposition in your outfit. Below, we’ve gathered an array of gorgeous shoes that will be the finishing touch to any look you’re wearing. Scroll down to see them all, and don’t hesitate to add a few pairs to your cart, too. We can't get over this gorgeous print. Lace heels will always feel luxe. 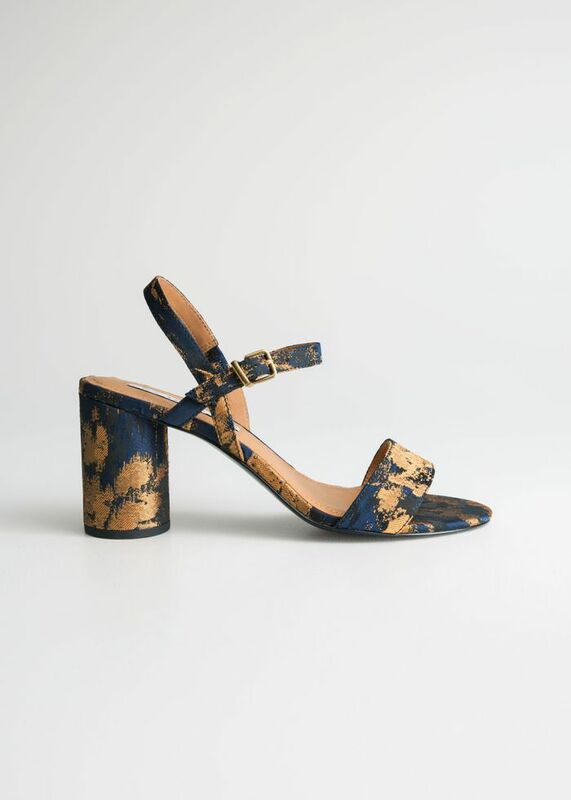 The block heel make these more comfortable than your stilettos. You'll never get tired of this three-strap sandal. Wear these for all your formal occasions. The periwinkle color is surprisingly versatile. Wear these to black tie events and for your nights out. Now these sandals will feel special. Slip these on whenever you want to have some extra polish. A pair of minimalist sandals will go with everything you own. You're bound to get compliments on these lamé and PVC heels. The chain embellishment elevates these to the next level. Dress these colorful heels up or down. There's a reason It girls love these shoes. Strappy crystal-embellished sandals will always be in style. These heels have the perfect touch of playfulness. Yes, PVC shoes are still a major trend. We're still not over simple and classic strappy sandals. Need more? These shoes are guaranteed to put you in a good mood.